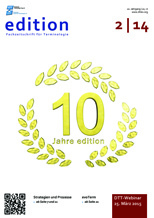 ﻿ edition - Die Fachzeitschrift des Deutschen Terminologie-Tag e. V. - Deutscher Terminologie-Tag e.V. 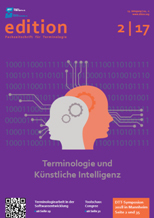 Seit 2005 gibt der Deutsche Terminologie-Tag e.V. regelmäßig die Terminologiefachzeitschrift edition heraus. edition erscheint zweimal pro Jahr (jeweils am 1. Juni und am 1. Dezember) und richtet sich an alle, die sich in irgendeiner Form für Terminologie interessieren. In edition werden terminologisch relevante Themen aus Praxis, Forschung und Lehre aufgegriffen. Es wird aber auch aus solchen Fachgebieten oder Disziplinen berichtet, deren Kerngeschäft zwar nicht primär terminologisch ist, für die Terminologie aber einen unverzichtbaren Bestandteil darstellt. edition wurde 2015 in den European Reference Index for the Humanities and the Social Sciences (ERIH Plus) aufgenommen. Sie entspricht den allgemein gültigen internationalen Anforderungen (ISSN, Redaktionsbeirat, Doppelblindgutachten, Beiträge in deutscher und englischer Sprache usw.) und wird in mehr als 30 Bibliotheken im In- und Ausland ausgelegt. Anfragen richten Sie bitte an redaktion(at)dttev.org. Autorin: Christine Bruckner Despite significant advances in machine translation (MT) quality, effective handling of terminology is challenging for most MT technologies. This article provides an overview of terminology integration and control in different MT approaches as well as in the “augmented translation” scenario, and looks at the difficulties as well as the options in each case. 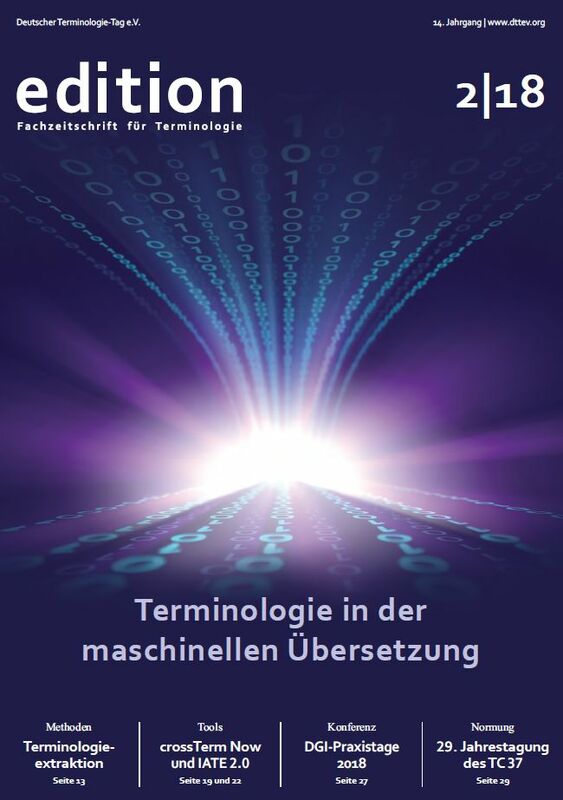 Autor: Micha Kohl Automated terminology extraction is a challenge of growing importance. This article presents a system that takes a hybrid approach to the problem and combines information from statistical as well as linguistic sources and methods. Its evaluation on German texts shows promising results for single as well as multi-word extraction. Autorin: Nicole Keller Immer häufiger äußern Nutzer bzw. Terminologen den Wunsch, dass Terminologieverwaltungssysteme auch die Möglichkeit bieten, Änderungswünsche oder Anträge auf neue Einträge systematisch und geordnet direkt im System bearbeiten zu können. Aus diesem Grund hat die Across Systems GmbH nun ihre webbasierte Terminologielösung crossTerm Now um eine neue Workflow Komponente zur Prozessverwaltung von Terminologieaufträgen erweitert. Autorin: Violina Stamtcheva Die EU-Terminologiedatenbank IATE ist das Werkzeug für Übersetzer der EU-Institutionen und für Übersetzer weltweit, die mit EU-bezogenen Texten arbeiten. IATE ist mit über 8,7 Millionen Begriffen in den 24 Amtssprachen der EU die weltweit größte Terminologiedatenbank und wird von insgesamt 13 EU-Einrichtungen verwaltet. Nach nunmehr fast 15 Jahren war es deshalb höchste Zeit, die Datenbank zu modernisieren. Autoren: Petra Drewer, Donatella Pulitano und François Massion This article discusses the interaction between terminology and other fields of study pertaining to knowledge and knowledge representation, thus mutually enhancing the quality and value of tools and contents (terminology databases, ontologies, knowledge modelling, etc.). These new developments will affect terminologists and other language workers in the future. Autorin: Kara Warburton The present article describes the creation of DatCatInfo, a Data Category Repository for language resources that replaces the former ISOcat. It raises key challenges such as the lack of a clear definition of what a data category is, and how to coherently organize them into thematic domains. AutorIn: Rachel Herwartz und Holger Brüggemann Terminological consistency of designations on the graphical user interface (GUI) and in all parts of the product gains more and more signifi cance for the usability of software. Therefore, support to ensure linguistic and terminological quality is absolutely essential at all stages of the software development process. With the help of termXact Desktop Checker, it is possible to check both the GUI texts and the software documentation for use of the correct terminology. Autorin: Farah Al Khatib As a hybrid tribunal of international character with Arabic, English and French as official languages, and applying both Lebanese law and international law to the crimes within its jurisdiction, the Special Tribunal for Lebanon (STL) is unique in all its work aspects, including its terminology work. STL drafters and translators on the one hand, and terminology managers on the other hand, face considerable terminological challenges. Autorin: Nicole Keller Congree ist ein Tool, das Autoren in puncto Konsistenz, Verständlichkeit und übersetzungsgerechtes Schreiben unterstützt. Es geht also primär um die Prüfung von einsprachigen Texten und nicht um die Überprüfung von korrekten oder konsistenten Übersetzungen. Ziel ist also in erster Linie, konsistentere und damit qualitativ hochwertigere Quelltexte zu erstellen, um z. B. auch nachgeschaltete Übersetzungsprozesse zu optimieren. Autorinnen: Natascia Ralli und Klara Kranebitter bistro is the database of legal terminology in Italian, German and Ladin developed by Eurac Research. bistro is now online with a new design and new functions: filter by language, legal system and legal domain; search for synonyms; visualise collocations; access full bibliographic references from bibliographic sources in terminological entries. Autor: Bassey E. Antia We are all too familiar with hand-written terminology-related notes on the margins of texts. Thanks to technology, these marginal notes can be semiotically remediated as widget-based glosses in order to maximise their utility and to enhance text comprehension in multilingual learning environments. Autorin: Nicole Keller Die Plattform Coreon ist ein rein webbasiertes, multilinguales Wissenssystem, das im Vergleich zu herkömmlichen Wissens- oder Terminologiesystemen verschiedene Ansätze aus beiden „Welten“ zur Datenverwaltung integriert. Zugrunde liegt hierbei zunächst eine einzelne Datenbank (Repository), in der die Wissens- und Terminologiedaten anhand mehrsprachiger Taxonomien, Thesauri-Strukturen sowie Klassifi kations- und Begriffssystemen strukturiert und abgebildet werden. 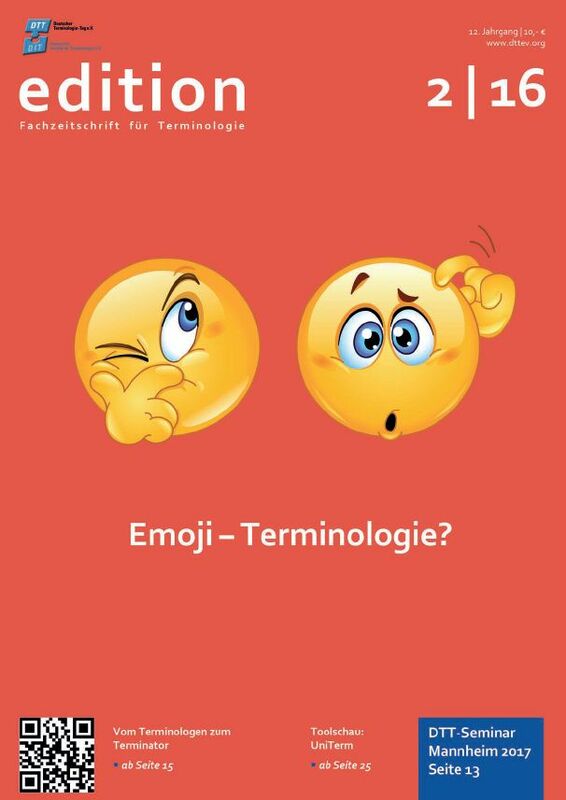 Autor: Tamara Arndt Emoji are heavily used in nowaday’s electronic communications all over the world. This article approaches the question whether emoji can be viewed as a universal language from both a technical and a terminological point of view. Three aspects are discussed in detail: the technical implementation, the interpretation, and the abstractiveness of emoji. Autor: Felix Sasaki This article summarizes the state of linked-data in the realm of terminology. We will first describe what the linked-data paradigm is and which general application areas have emerged so far. We will then move from general considerations with regards to terminology to specific applications. These are often based on the linked-data format OntoLex, a de facto standard for representing terminology information as linked-data. Finally, we will describe emerging terminology applications relying on linked-data. Autoren: Marta Otero und Vivien Krämer Terminology management in a company is more than simply maintaining a multilingual terminology database. It is an extensive task with interfaces to many other departments. It is more than a purely linguistic task, but also comprises visualizing knowledge, creating taxonomies, and providing guidance to user documentation and user interfaces. SCATE: Smart Computer-Aided Translation Environment – What about terminology in the translation process? Autor: Frieda Steurs Translation environment tools (TEnTs) are relatively common and easy to access nowadays. However, many translators do not necessarily like these tools, as working with them still does not result in optimal search and retrieval of good terms and possible translation alternatives. The SCATE (Smart Computer-Aided Translation Environment) project aims primarily at the improvement of translator efficiency. One of the work packages in this project is designed to provide domain knowledge and easy access to multilingual terminology. We report on the results of this project now that the initial phase has been completed. 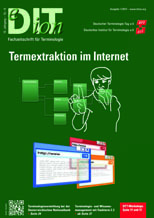 Autor: Nicole Keller Acolada bietet seinen Kunden ein sehr umfangreiches Produktportfolio, das ein- und mehrsprachige Lösungen im Bereich Content Management (Sirius), elektronische Wörterbücher (UniLex) und das Terminologiesystem UniTerm umfasst. Dieser Artikel befasst sich ausschließlich mit dem Terminologiesystem UniTerm Pro. Autor: Gerhard Budin The article reconstructs the contribution of Austrian philosophy in the 19th century to the development of the theory of terminology. 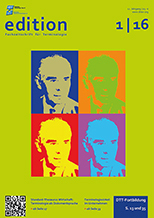 Philosophers such as Brentano, Marty, Meinong, Husserl and Carnap developed theories on epistemology and ontology that gave Eugen Wüster in the late 1920s and early 1930s the major impetus and inspirations for the development of his theory of terminology. 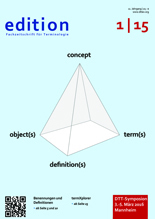 Autor: Andreas Oskar Krempf The following article deals with the use of terminologies as documentation language. Using the example of development, maintenance and application of the STW Thesaurus for Economics it illustrates the specific challenges for a standard-based terminology management under changing conditions of reuse and application. 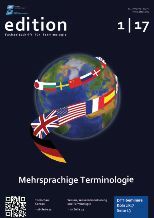 Autor: Christiane Zehrer Project specific terminology (PST) has only recently entered the discussion on professional language use. After a short discussion of the concept PST and its functions, this article illustrates how PST works, and encourages language professionals to adopt new practices that help foster an effective use of PST. Autoren: Beate Früh und Florian Deubzer For many years terminology management has been praised for its benefits for knowledge management. However, commercial tools used for the administration of terminological data did not support this field of application in a satisfactory way. A new generation of commercial software tools offer now additional features to support the usage of terminologies as a means of knowledge organisation. Autor: Johannes Widmann From R&D to Marketing or After-Sales: most departments of any company benefit from efficient terminology management. That’s why more and more companies invest in a company-wide terminology team. This article explains how to set it up and offers 10 tips with a focus on critical steps. Autor: Mark D. Childress The terminology management team in an organization is ultimately responsible for creating an overarching terminology strategy in order to ensure the success of terminology work. The strategy must be coordinated with the strategies of the organization as well as with those of the stakeholders in terminology work. To that end the terminology management team needs to identify the major factors affecting terminology work and account for their influence as part of a well-constructed terminology strategy. Autorin: Jasmin Nesbigall It's a long way to establish terminology in a company. And it's an even longer one to maintain and expand it, especially when there is more than one language to work on. Terminology in foreign languages is often kept up-to-date by language service providers (LSP) who comment on improper terms and suggest new ones during translation. Thus, companies rely on the input of their LSPs and should establish a joint workflow. This article presents examples of best practices. Standards for language resources in ISO – Looking back at 13 fruitful years? Autor: Laurent Romary This paper provides an overview of the various projects carried out within ISO TC 37/SC 4 dealing with the management of language (digital) resources. On the basis of the technical experience gained in the committee and the wider standardization landscape the paper identifies some possible trends for the future. Autor: Christian Kriele Medical invoices in Switzerland are highly specialised texts and are often very difficult for laypersons to understand. A research project based at the ZHAW Zurich University of Applied Sciences aims to redesign such texts by creating a version which will be accessible to non-specialists and allow them to check the content more easily. One very important aspect taken into account is the use of specialised terminology. Autor: Michael Wetzel Language resources like lexicons, glossaries, dictionaries, and terminologies here; knowledge systems such as taxonomies, classification systems, nomenclatures, thesauri, ontologies, encyclopaedias and wikis there. All capture either language or knowledge to a varying degree. Multilingual Knowledge Systems (MKS) capture both: language and knowledge. Where is the value in such a fusion of – historically – rather separated worlds? method is particularly ideal as it is morphologically transparent. 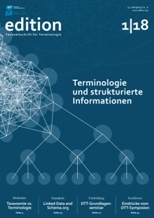 Autor: Klaus-Dirk Schmitz The definition is a very important knowledge unit for terminology work and terminology management. It allows to describe and explain the concept. But there exist different types of definitions as well as different recommendations for writing definitions. Managing definitions in termbases require a wise and adequate design of the terminological data model. Mehrsprachige Terminologiearbeit und Kulturdimensionen – Konflikt vorprogrammiert? Autorinnen: Angelika Ottmann und Carmen Canfora Cultural dimensions are widely used in cross-cultural communication, but have not received much attention in terminological theory so far. Languages of a “low-context culture” are very explicit, using a lot more differentiated terms as languages of a “high-context” culture, which are less explicit and use more general terms. 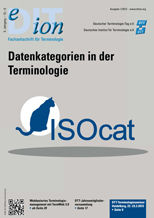 Autorin: Kara Warburton The ISO TC 37 Data Category Registry, also known as ISOcat, is an important electronic resource for researchers and practitioners in various linguistic disciplines. It is currently being migrated to a new hosting environment. The present article explains why, and describes the challenges encountered in the initial migration stage. Autorin: Cindy Tscherwinka In the recent past tools that allow for automatic and comparatively cost efficient creation of terminology lists based on previously translated content have been developed by several providers. As they are widely used, terminological assets are likely to grow in quantity very fast. But does quantity equal quality in terminology? 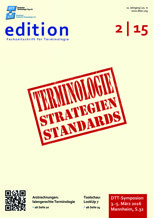 Autor: Peter EbenhochTerminology management often aims to strictly unify the terminology of an organization. This article argues with references to strategic management to take into account specific demands of a company in order to support innovation, enable the implementation of organizational changes and to reach new customer groups in order to utilize the inherent power of terminology management at its best. To achieve this a layered concept of terminology areas is proposed. Autorin: Annette WeilandtEstablishing a consistent corporate language can be a complex task for companies. Many factors have to be taken into consideration due to the dynamic and multi-faceted company environment. A process-oriented approach for the terminology management helps to define and implement a standardized terminology definition process. Autor: Maurice MayerClean translation memory and terminology databases represent a key precondition for creating high-quality translations. On the basis of the Across TM system, this article shows how language databases can be optimized and cleaned with the help of integrated software functions. Autorin: Eva-Maria LeitnerComprehensive quality management in translation is a holistic approach with strong emphasis on preventive quality management to reduce costs on both sides, the customer and the language service provider. Hence, solid terminology work is a sine-qua-non upfront and during a translation project in order to provide a sound basis for a successfully completed project to the full satisfaction of customers. In this article, a case study shows how projects may fail due to missing preventive quality management and terminology work. Autorin: Anne-Kathrin Schumann Die klassische Termextraktion beschränkt sich in der Regel auf die Gewinnung relevanter Benennungen aus Referenztexten. Oft sind dabei zusätzliche (semantische) Informationen erforderlich, die über die Festlegung von klassischen Definitionen und Begriffsbeziehungen hinausgehen. Anne Schumann von der Universität des Saarlandes zeigt auf, wie sich extrahierte Einheiten mit wissenshaltigen Kontexten anreichern lassen. Autoren: Lauri Carlson, Shanshan Wang, Kun Ji und Igor Kudashev An der Universität Helsinki haben finnische und chinesische Forscher mit TermFactory eine Software-Plattform für mehrsprachiges Terminologie- und Wissensmanagement entwickelt, die auf die Anforderungen des Semantic Web zugeschnitten ist. Das OWL-basierte Toolkit integriert Schnittstellen zu anderen Webressourcen und ermöglicht neben der Ausgabe unterschiedlich strukturierter Daten (Tabellen-, Baumstruktur) auch lexikographische Darstellungen. Autorinnen: Anja Peschel und Katherina Polig Das Freiburger Übersetzungsbüro Peschel hat auf ein professionelles Terminologie-managementsystem umgestellt. Welche Entscheidungen dabei im Vorfeld getroffen werden mussten und welche Probleme beim Einpflegen der terminlogischen Einträge zu lösen waren, beschreiben Unternehmensleiterin Anja Peschel und Mitarbeiterin Katherina Polig. Autor: Wolfgang Sturz Terminologiearbeit steht in vielen Unternehmen im Spannungsfeld zwischen Verwalten und Managen. Meist steht dabei das reine Verwalten im Fokus. Doch ein aktives Managen mit allen betriebswirtschaftlichen Aspekten ist heute so wichtig wie nie. Denn es geht um mehr als um rein terminologiearbeitstechnische Fragen – es geht um eine Gesamtstrategie für das Terminologiemanagement. Autorin: Ingrid Haussteiner Der Sprachendienst der Oesterreichischen Nationalbank (OeNB) nutzt unterschiedliche Ansätze, um die Kollegen und Kolleginnen beim Er- und Verfassen zumeist englischsprachiger Texte zu unterstützen. Eine wichtige Rolle spielt dabei die Terminologiedatenbank im Intranet. Der folgende Beitrag zeigt, wie dank neuer Funktionalität den Nutzern und Nutzerinnen ausgewählte Informationen auf spielerische Weise nähergebracht werden. Autorin: Nicole Keller Die Version 2.3 des webbasierten Terminologiemanagementsystem flashterm der Eisenrieth Dokumentations GmbH wartet mit zahlreichen, interessanten Neuerungen auf. So lässt sich z. B. auf eine Eintragsansicht umstellen, die auf die Bedürfnisse von Dolmetschern zugeschnitten ist. Autoren: Dagmar Gromann, Nathan Rasmussen und Alan Melby Terminologische Ressourcen sind für Übersetzer wichtig, liegen jedoch in vielen unterschiedlichen Formaten vor. Der Industriestandard TBX (TermBase eXchange) ermöglicht den standardisierten Austausch dieser Ressourcen. 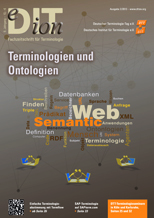 Das Semantic Web bietet eine Vielzahl von maschinenlesbaren Daten mit expliziter Semantik und Technologien wie etwa das Resource Description Framework (RDF) oder die Web Ontology Language (OWL), die sich für Terminologien nutzen lassen. Im vorliegenden Beitrag soll insbesondere der von den Autoren entwickelte Konvertierungsmechanismus TBX/RDF vorgestellt werden. Autor: Christian Stein Im November ist an der Humboldt Universität zu Berlin der Exzellenzcluster „Bild Wissen Gestaltung“ gestartet, der sich selbst als „interdisziplinäres Labor“ bezeichnet. Die Idee hinter diesem Großprojekt ist es, unterschiedlichste wissenschaftliche Disziplinen in ungewöhnlichen und neuen Zusammenstellungen an Fragen unserer Zeit arbeiten zu lassen. Dabei kommen nicht nur Geistes-, Natur- und Technikwissenschaften zusammen, sondern erstmals gleichberechtigt auch Designer und Gestalter. Insgesamt sind über 25 Disziplinen beteiligt. So arbeiten in einzelnen Basisprojekten beispielsweise Architekten, Kunsthistoriker, Informatiker, Chemiker, Kulturwissenschaftler und Interaction Designer zusammen an einer gemeinsamen Fragestellung. Autor: Georg Löckinger ISOcat, frei verfügbar unter www.isocat.org, ist ein internationales Verzeichnis von Datenkategorien, das für den Aufbau und die Gestaltung verschiedenster Sprachressourcen genutzt werden kann. Den historischen Kern von ISOcat bilden Datenkategorien für die übersetzungsorientierte Terminografie. Im vorliegenden Beitrag werden neue und adaptierte Datenkategorien vorgeschlagen, die sich auf aktuelle Forschungsergebnisse stützen. Autorin: Nicole Keller Die Transline Deutschland Dr.-Ing. Sturz GmbH hat mit Termflow eine mobile, webbasierte Eigenentwicklung auf den Markt gebracht. Neben herkömmlichen Funktionen hat das Reutlinger Unternehmen bei der Entwicklung besonderen Wert auf managementspezifische Features gelegt wie Planung, Steuerung, Prozesskopplung, Schnittstellenmanagement und Controlling. Autoren: Sue Ellen Wright und Menzo WindhouwerIm ISOcat-Datenkategorie-Register (Data Category Registry, www.isocat.org) des Technischen Komitees ISO/TC 37 (Terminology and other language and content resources) werden Feldnamen und Werte für Sprachressourcen beschrieben. Empfohlene Feldnamen und zuverlässige Definitionen sollen dazu beitragen, dass Sprachdaten unabhängig von Anwendungen, Plattformen und Communities of Practice (CoP) wiederverwendet werden können. Datenkategorie-Gruppen (Data Category Selections) können eingesehen, ausgedruckt, exportiert und nach kostenloser Registrierung auch neu erstellt werden. Autor: Klaus-Dirk SchmitzDie Verwaltung terminologischer Daten erfolgt heute immer mit Hilfe von Computern. Dabei ist es unabdingbar, die jeweiligen Daten vernünftig und konsistent zu strukturieren. Die Modellierung terminologischer Daten basiert weitgehend auf wohldefinierten Datenkategorien. Dieser Beitrag greift die Idee der Datenkategorien auf und zeigt die geschichtliche Entwicklung von den ersten (computerlosen) Ansätzen bis hin zu webbasierten Datenkategorie-Verzeichnissen. Autorinnen: Bodil Nistrup Madsen, Hanne Erdman Thomsen, Tine Lassen, Louise Pram Nielsen, Anna Elisabeth Odgaard und Pia Lyngby HoffmannWe present a proposal for a taxonomy for terminological data categories, which will help users and designers of term banks get an overview and identify individual data categories when choosing and describing data fields. This proposal also implies simplifications to be introduced in the ongoing revision of the standard for TermBase eXchange (TBX). Autorin: Anja RüttenDa es zwischen der Arbeit von Dolmetschern und Übersetzern viele Ähnlichkeiten gibt, stellt sich die Frage, ob die für Übersetzer konzipierten Terminologiemanagement-Komponenten gängiger Translation-Memory-Systeme nicht auch für Dolmetscher nützliche Instrumente sein könnten. Im nachfolgenden Artikel werden vor dem Hintergrund der besonderen Anforderungen im Konferenzdolmetschen exemplarisch drei Systeme betrachtet. Autorin: Nicole Keller TermWeb vom schwedischen Forschungs- und Entwicklungsunternehmen Interverbum Technology ist ein rein webbasiertes Terminologieverwaltungssystem und kann daher ganz unkompliziert über einen Webbrowser gestartet und bedient werden. Das bedeutet, dass TermWeb somit ein plattformunabhängiges Tool ist, das jederzeit und standortunabhängig aufgerufen werden kann.